We hope you'll play along! 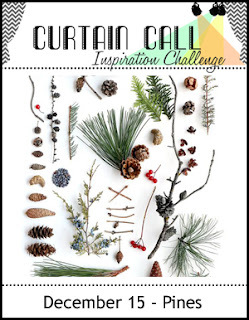 Please visit the Curtain Call Challenge blog for all the challenge info and deadline. Here's my take on the inspiration photo. I don't have any pinecone stamps in my collection, so I went with a general pine theme. I used the Funky Wreaths-All Season stamps and dies from SugarPea Designs to make a seasonal wreath. The wreath itself was stamped in olive pigment ink, then I filled it in with berries stamped in red pigment ink. 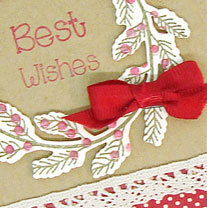 The wreath was die cut with the matching die, then adhered to a kraft card base using foam tape for dimension. The "best wishes" sentiment was stamped in the center of the wreath. I accented it with a tiny red bow, tied using my Bow Easy--which, sadly, I realized has a broken piece . 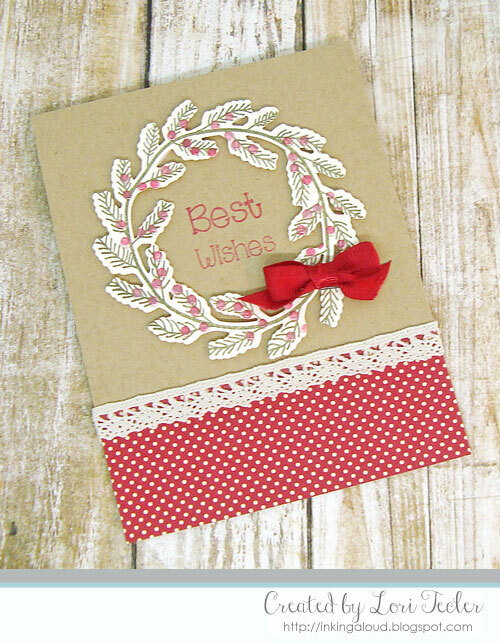 . . To go with the seasonal theme, I adhered a red patterned panel with cream dots to the bottom of the card base, then added a strip of cream trim across the top of the dotted panel. The final touch was dotting a bit of Glossy Accents on each of the berries for a shiny, dimensional look. The best part is that I managed to do this without smearing a single berry! Stop by the Curtain Call Inspiration Challenge: Pines for the challenge details and to play along with us! Beautiful take on the inspiration, Lori! 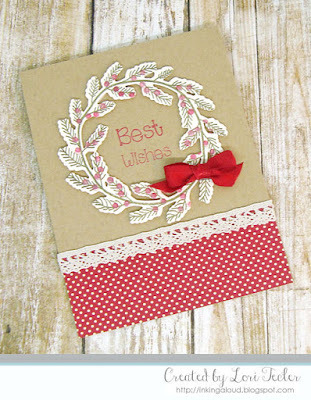 Love the mix of Kraft & red polka dot paper! Such a pretty card Lori. Lovely wreath. The polka dot paper looks great. I also love the delicate trim. Adds an elegant touch to the card. Happy Holidays! Such a fabulous wreath and love the kraft and red combo! Blessings for a fabulous Christmas! Oh, this is so pretty, Lori! Wonderful take on the inspiration photo! I've really enjoyed being on this team with you -- wishing you all the best! This is so lovely! Love the tiny bow and lace detailing! Beautiful! It has been great being on this challenge team! Of course, I will still see your lovely creations in blogland! Merry Christmas! Pretty card Lori! Merry Christmas! Lori, this card is just gorgeous!! !